Practical exercises help you prepare for success in exams and in massage therapy practice! 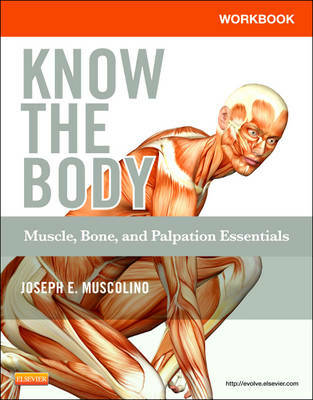 Corresponding to the chapters in Muscolino's Know the Body: Muscle, Bone, and Palpation Essentials, this workbook includes review activities to help you learn and apply muscle, bone, and palpation knowledge. and Exercises cover muscle identification plus attachments, actions, stabilization functions, nerve innervation, palpation, and treatment considerations for each of those muscles. You'll also review and study bone identification, bony palpation, basic kinesiology terminology, the skeletal system, and muscle function. Exercises range in complexity from simple memory problems to more difficult critical thinking activities. Chapter-by-chapter, comprehensive review covers all of the content from the Know the Body textbook to ensure that you are prepared for exams and for practice. Photos of joint movements provide a better understanding of movement and range of motion, as compared to simple drawings. A wide range of fun, interesting review activities includes structure identification and labeling, coloring, matching, true/false, multiple choice, short answer, crossword puzzle, jumble, and mnemonic fill-in-the-blanks. High-level exercises help in developing critical thinking abilities and understanding how to apply muscle, bone, and palpation knowledge in the treatment room. Perforated pages make it easy to remove exercises from the workbook and hand in for grading. Answers are included at the end of the workbook, to help you pinpoint strengths and identify areas that need further study.